An gyera sibil amo an usa ka gyera nga nahihitabo ha usa ka nasod han duha ka organisado nga grupo. Mats Berdal and David M. Malone, Greed and Grievance: Economic Agendas in Civil Wars (Lynne Rienner, 2000). Collier, Paul; Sambanis, Nicholas, eds. (2005). Understanding Civil War:Evidence and Analysis. 1: Africa. Washington, DC: The World Bank. ISBN 978-0-8213-6047-7. http://books.google.com/books?id=OnGQQVuIBjgC&pg=PP1&dq=Understanding+Civil+War:Evidence+and+Analysis&cd=1#v=onepage&q=&f=false. Collier, Paul; Sambanis, Nicholas, eds. (2005). 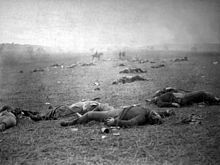 Understanding Civil War:Evidence and Analysis. 2: Europe, Central Asia, and Other Regions. Washington, DC: The World Bank. ISBN 978-0-8213-6049-1. http://books.google.com/books?id=yNTQ-BDLPxIC&pg=PP1&dq=Understanding+Civil+War:Evidence+and+Analysis&cd=2#v=onepage&q=&f=false. Stathis Kalyvas, "'New' and 'Old' Civil Wars: A Valid Distinction?" World Politics 54, no. 1 (2001): 99-118. David Lake and Donald Rothchild, eds. The International Spread of Ethnic Conflict: Fear, Diffusion, and Escalation (Princeton University Press, 1996). Roy Licklider, "The Consequences of Negotiated Settlements in Civil Wars, 1945--1993," American Political Science Review 89, no. 3 (summer 1995): pp 681–690. Andrew Mack, "Civil War: Academic Research and the Policy Community," Journal of Peace Research 39, no. 5 (2002): pp. 515–525. David T. Mason and Patrick 3. Fett, "How Civil Wars End: A Rational Choice Approach," Journal of Conflict Resolution 40, no. 4 (fall 1996): 546-568. Monica Duffy Toft, The Geography of Ethnic Violence: Identity, Interests, and the Indivisibility of Territory (Princeton NJ: Princeton University Press, 2003). ISBN 0-691-12383-7. Ini nga pakli kataposan nga ginliwat dida han 04:30, 2 Pebrero 2015.